Please forgive me. 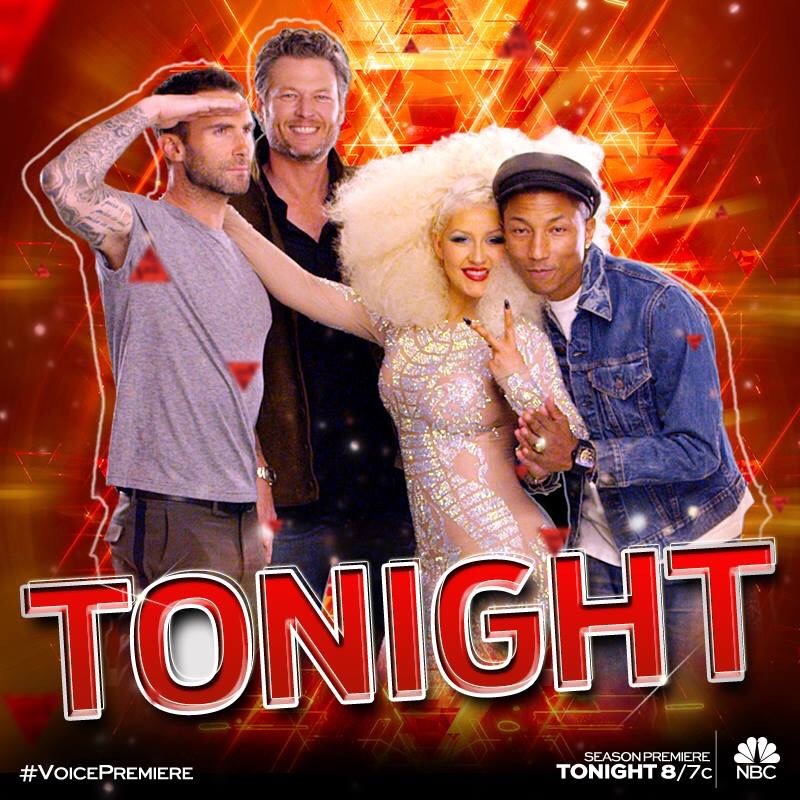 I totally forgot that The Voice Season 10 Premiere was starting this evening. Thank you to one of my readers, Vonnie, for unfreezing my brain. It has already aired on the East Coast but I am right on time for the West Coast Feed which begins at 8:00 PM West Coast time on Monday, February 29th on NBC. Then there will be more of the same tomorrow! Same time, same station, same format. So, discuss away The Voice fans. This topic is fresh out of the oven and ready to be devoured by your comments. Enjoy the show! Blake picked up a really neat girl, she sang where the boys are! I really liked her too! I love the judges on the Voice; so much fun! My goodness Vonnie. That was a highly coincidental comment. On the way home last night I heard Where The Boys Are on the radio and wondered when/if AI or the Voice would have someone sing the song in the future. I liked her last night. I also love Dwight Yoakum, in particular his variations on yodeling. I have always thought “I Sang Dixie” would be a one-of-a-kind song for any AI/Voice performance except none of the contestants has the training to do that little catchy, yodelly thing Mr. Yoakum does at the end of the song. I also would have loved to have heard “This Much I Know”, my other favorite Yoakum song, with Alison Irehita singing backup in a dim spotlight behind the contestant. One can only dream. If you like rock-a-billy, youtube has a special with Ringo Starr, George Harrison, Eric Clapton, and one of the Cash’s celebrating and singing the songs of and along with Carl Perkins. Might be one of the great shows of all time, along with the Roy Orbison Black and White special. My favorite so far is Alisan, a.k.a., Curly Sue. Her experience and talent blows everyone who came before her away. BTW, according to MJ’s Blog, she’s friends with Adam Lambert. I love Rock-A-Billy and Doo-Wop, anything from the fifties and early sixties too! I also felt he could have jumped right in to a Buddy Holly song and done it much justice! The young lady who sang where the boys are, said she likes old country, Blake is going to have a top three contestant. I am very excited about this season; how exciting to see these styles of music on the Voice stage!!! Great start to the season! These singers crushed the AI singers! It was also nice to see them promoting Jordan and his album. About time they did this for their winners. Mary Sarah that did “Where the Boys Are” is one to keep an eye on. Some how this girl was able to pull together quite a few A list country stars to make an album with her, Dolly Parton, Vince Gill,Merle Haggard, the late great Ray Price, Willie Nelson and The Oak Ridge Boys. That’s quite a feat for a young unknown singer to pull off. I was very impressed with her confidence in choosing a classic beach movie pop song like this one and doing such a solid delivery of it. I loved it. The last girl choose one of my favorite songs, both Roy’s original and IMO, the better Linda Ronstadt cover. Curly Sue did a pretty good job but I thought she sort off over cooked it showing off a little. The song doesn’t need all of that. Hopefully that isn’t a habit and having X for a coach is likely to make it worse. The Elvis Guy was cool as well. I agree, some Buddy Holly from him would be pretty cool. Maybe Smokey Joe’s Cafe. I like Dwight too. His acting is interesting as well. By the time Karl put that Kaiser blade in his skull (some people call it a sling blade, I call it a Kaiser blade) Dwight had you believing he needed it. I’ve seen the video you mentioned Don. That was Rosanne Cash. She has an interesting album called “The List” which are songs that her dad (Johnny) gave her listed on a scrap of paper and told her that she needed to study them if she was serious about becoming an artist. BTW, you must have slipped into the Twilight Zone if “Where The Boys Are” was playing on the radio. Just sayin. Dwight is a great actor too! Mean ole Doyle! Blake picked up two good singers tonight! Some great talent this time! Ummmm hu, I like the way you talk.”Could you make me some biscuits with mustard on um? The oversexed girl wasn’t a great singer but she knew what to do to get in the show. “Scaled him like a small tree.” That’s pretty funny! I know why the girl sang “Where the Boys Are” now. She had done it with Neil Sedaka, who wrote music for the song, on the duet album that I mentioned above. I guess Connie Francis wasn’t available. With that last girl last night, my expression matched that of Pharrell. My area of the country has a radio station that plays songs from the 1930s through 1970-80ish. One is as likely to hear Connie Francis as Patti Page or Ella Fitzgerald or the Beatles. WTBA was purely coincidental. (As it turns out I had listened to Joe Cocker’s version of “The Letter” about ten minutes before the guy sang it last night. I was concentrating on the piano riffs and how it takes a certain singer with an innate internal rhythm to pull it off.) The station also plays a piano version of the Star-Spangled Banner (by a Canadian pianist!) every noon-time and lately has been taking to playing God Bless America by Kate Smith at 9:00 AM. Sinatra and Big Band on Saturday afternoons and Country on Sunday morning. It is a great, unintended history lesson, almost like listening to the musical essence/style of each generation as it passes. I am older so it also generates some terrific memories. And self-funded, so no commercials! My guess is some of the judges start picking cannon fodder after the first few picks because they know they are going to have to shed some contestants. That seemed to be more the role the last girl would fill for Christina last night. LOL…Pharrell’s expressions were hysterical. I didn’t care for her voice very much, I think Blake not turning for her said a lot. I would have loved to have seen the backstage catfight over her choosing Christina instead of Adam, as she was so encouraged by her partner! Gene, have you seen the video running around with the guy who orders from starbucks (I think); anyhoo, he is ordering French fried taters! It is pretty funny! Forgot. In light of the album you noted above, the station played the Oak Ridge Boys’ “Alice is in Wonderland” on the way in this morning. That sounds like a great radio station you have there. I seldom listen to the radio anymore. For some reason the music they play from any genre aren’t the songs that I would chose to listen too. I envy your radio station. Odd you would mention the Letter. i didn’t get to see the early part of the show due to severe weather coverage but I have been to two concerts lately with a “Letter” connection. You mentioned the piano riff in the song. That was Leon Russell who served as the music director for Joe Cocker’s Mad Dogs and Englishmen concert. I had the tremendous opportunity to see Leon in a small venue her in town and I was in hog heaven. He did the Letter during that show as well as “Superstar” which another of these contestants (can’t remember who) has sung in the last year. Also, I’m a big fan of the Tedeshi Trucks band and have seen them live three times now. Over the last year they did a tribute to the Mad Dogs concert and album by inviting every one of the original band members and back up singers who are still living and able to join their band in recreating the entire concert. They had Leon Russel, Chris Stanton, Rita Coolidge and maybe a dozen more that were able to participate. I didn’t see that concert live but it’s on You tube. But they did incorporate several of the songs from Mad Dogs into their last tour. The Letter was one of them. I have not seen the “Carl goes to Starbucks video” and their is no danger of me seeing him their either. I do not darken their doorway. Gene, it’s not an official Starbucks video, it’s a guy with his wife, she is videoing him at a drive through ordering French fried taters, it is pretty funny! Yeah, that’s what I thought you meant. I just thought I would take a cheap shot at Starbucks while I was at it. I hate it when they have some of the auditions montaged. Maybe they’ll be shown during the best of the auditions episode. Vonnie said: I love Rock-A-Billy and Doo-Wop, anything from the fifties and early sixties too! Rocker Chick…I love music! There are so many genre’s that I enjoy…I can say pretty much everything except for Rap; can’t seem to wrap my brain around that one! LOL, I love the second British Invasion in the 80’s!!! Idol Girl…yes! My son was listening to that “possessed” sounding music, I’m not sure how they get their voices to sound like that, makes the hair stand up on the back of my neck…I don’t like that! 😳 I must be old…because I have heard myself call it devil music, just what my parents used to call my music! 😃 except I think this really is!!! I think you can get the radio station on line. I would google “radio station WJIB Cambridge MA” and I think there is a way to listen via the internet. Thanks for the information Don. It appears that WJIB doesn’t have a live stream. They come up on search results but when I click on the results, there is no stream available. Sounds like a good station for those who can get it though. Thanks again.